Best Indian Jones costume for most affordable price? Discussion in 'Replica Costumes' started by Egon Spengler, Jul 16, 2006. Well, pretty much the title says it all. Looking to put together a lower budget but not crappy quality Indiana Jones costume I could upgrade over time. Basically trying to find the lowest priced options out there for shirts, hats, pants, etc. Items I can buy and modify? Maybe make this topic into a "list" of sorts. Listing where to purchase the most affordable costume pieces you know? Like... just for example and please don't take the prices listed here seriously. and links to them. That sort of thing you know? 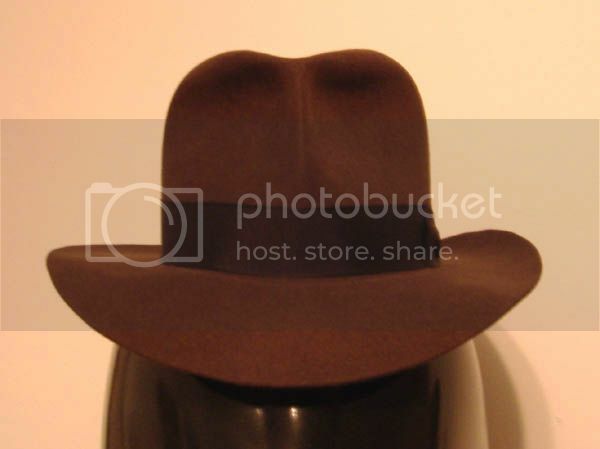 For a great budget but good quality fedora, try the Akubra Federation ($76.53: http://www.hatsdirect.com/cgi/products.cgi...s&returnpage=0) rather than the licenced Dorfman. The Federation is a rabbit felt hat and comes open crown so you can bash it in the style that you prefer. You can get the shirt here: https://host385.ipowerweb.com/~indyprop/osC...83b8f762e105e7e. Magnoli also makes the close enough pants (as well as the close enough MK bag and boots) so check it out on his website. A much cheaper option would be the L.L. Bean close enough Cotton Poplin Field Shirt (http://www.llbean.com/webapp/wcs/st...langId=-1&categoryId=45888&sc1=Search&feat=sr). Check out http://www.toddscostumes.com for the repro MKVII bag and leather strap, as well as the holster and belts. As for the jacket, I recommend you go for the real McCoy, a Wested (http://www.indyjacket.com). I'm not sure if there are any cheaper alternatives... most Indy lookalike jackets cost the same or more as the Wested, so going Wested would be a natural choice for me.. There are other options but the Wested is great value for money and trust me, you WILL love it. Check out http://www.indygear.com on options for the rest of the gear components. There was a thread over at the Indygear forums that mentioned a pair of pants sold at Dillard's under the name "Oak Creek" in the color "Saddle" that come with pleated fronts, a pretty close color, and close enough flaps on the back pockets, but you'd want to look into it soon and only if it's not too much trouble since they're phasing the brand out and probably have an extremely limited supply left. I've managed to find a few here and there in the past couple weeks. On the upside, if you find the pants they should only cost you $6.25 since they're on super-clearance. Also, Old Navy has a close enough shirt that's pretty nice that might do you well at $24.95. If you look through the forums at Indygear you can find more info on the shirt that I mentioned since that's where I learned of it. All of these are great suggestions so far, I can't add much more. LL Bean is running a sale on some wool trousers that make a pretty good "close enough" pair of pants. They're almost prefect except they aren't pleated like Indy's pants, but you'll be hard pressed to find a nicer pair of wool pants for $30. I have a pair (thinking about buying more, too) and I think they're great Indy pants. I've heard a lot of good things about the LL Bean shirt, and I own the Old Navy shirt. The Old Navy shirt is even on sale right now too. Most of my other gear also came from Todd's costumes, so I reccommend those highly as well. There's a lot of bang for your buck there. I have his web belt, gas mask bag, holster, and whip holder, and they're all great pieces and very affordable, too. I also totally agree with Kalkamel's suggestion to go ahead and get a real Wested leather jacket. Many, if not most of the "close enough" jackets are more expensive than the real thing, and I have to say that in this day it's tough to find a well made custom-made leather jacket for less than $300. That could be the one piece of gear you'll never have to upgrade, so it's a wise investment. Plus, it's just a great jacket, so it's more than just a costume piece, really. I got a cheap whip off of eBay, if you're not looking to spend much. I found something for about $20 that looks okay hanging off my belt, which is all I was looking for. I'm not planning on joining the circus as a lion tamer anytime soon. Are there any patterns for making a bag yourself or any of the other items? By trying to make a bag yourself, you'll probably only end up saving $20 and spend hours of frustration making it. You'd really just be better off buying a repro. Call me old fashioned but I like making my own props and costumes when I can. The bag is the one thing on this costume I could probably easily make myself. I'd still love any pointers as to where I can find a pattern. Deciding to go with a Wested now actually. Just not sure what style to pick. Anyone want to chime in? Well, the original jacket was lambskin in authentic brown, so I think that's the main starting point. The original jackets had "X-box" stitching on the side straps, with the rectangular fasteners. If you're a slimmer guy, or just want a more fitted jacket ask for the "80's fit," which is more like how the original jackets were made. Same thing with the pocket size, if you're closer to HF's measurement (he wore a 40 reg in Raiders) you'll probably want to ask for the smaller pockets as well. However, no matter what details you choose, you'll end up with a VERY well made jacket custom fitted to your measurements. It's a big difference to buying off the rack, that's for sure. As a point of departure my jacket is the dark brown lambskin, Temple of Doom length, with the larger pockets. I thought that fit my frame a little better. I have to chime in to support the decision to go with a Wested. Mine is 8 years old now and looks better than ever. There weren't as many options back then. I just asked for a Raiders and gave them my measurements. It's the dark brown lambskin. I had been meaning to show it off anyway, and don't want to hijack this thread with pictures. If you want to see what it looks like, look here; http://www.rpf.invisionzone.com/index.php?showtopic=113924 It is very much worth the cost, nothing else comes close, Imo. Which ever Wested you pick you will love. My favorite right now is my "Raiders" Goatskin. You can't go wrong with a Wested. The movie accurate version is authentic brown lambskin. Love my Wested jacket and wear it every chance I get even in this vegas heat. That should be on the top of your list. The guys at Indy gear are VERY helpful and every now and then someone is getting rid of gear to either upgrade or it's the wrong size. I got my jacket here and I have a pair of Wested pants coming in I picked up from a gearhead as well. Magnoli has some awesome stuff. A bit high priced for the budget minded but from what I've seen and what I'm told you get what you pay for and his quality is definately there. If you can afford it go with him. You can get just about everything from him now including boots. Here's a couple of other hats. One of them is pretty inexpensive at 42.00. I've never seen it in person, so I can't tell you anything about it. I had one of those wool "official" hats. All I did was wish I'd saved the $40 I spent on it towards the Akubra Federation. Which I ended up buying anyway. I've got one of those felt hats I've had for years. I reshaped it and it's not too bad. Here's a pic from Halloween last year. The only things not "authentic" are the hat, pants, and shirt. If you invest the money you do have in the hat and jacket then that will carry off cheap/alternative/substitute pants/shirts/boots etc. That's a great pic, Ken. best replica jacket making website? If I were to make an Airwolf pilot helmet, what would Be the best base helmet to model from?